It’s essential that under-threat nematicide products for controlling soil-borne pests in root crops are applied correctly. Adam Clarke paid a visit to a Lancashire potato grower who’s modified his planter set-up to achieve more accurate and safe application. 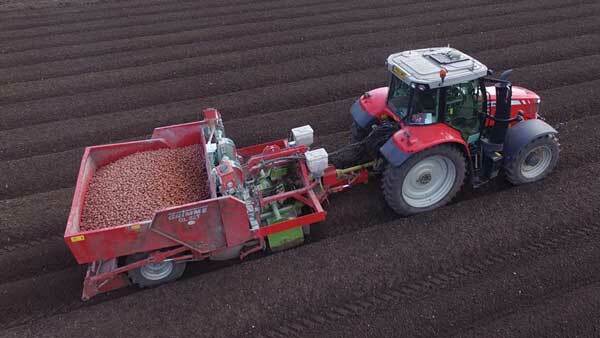 To take his nematicide application to a new level of precision and safety, one Lancashire spud grower has modified his planting system to ensure every granule is placed exactly where it needs to be. Farming just south of Ormskirk, Lancashire, Andrew Webster is in the middle of an intensive root crop and brassica veg growing area, which brings several pest problems across his 182ha of owned and rented land. Free living nematodes and wireworm can be an issue in some years and on some sites, but the major threat to his 73ha crisping potato enterprise is potato cyst nematode (PCN). To combat the issue Mr Webster is extending cropping intervals by sourcing cleaner rented or swapped land to supplement his own. There has also been a focus on improving field hygiene, with more vigilant control of volunteer potatoes and weed hosts throughout the rotation minimising the risk of PCN being propagated in other crops. 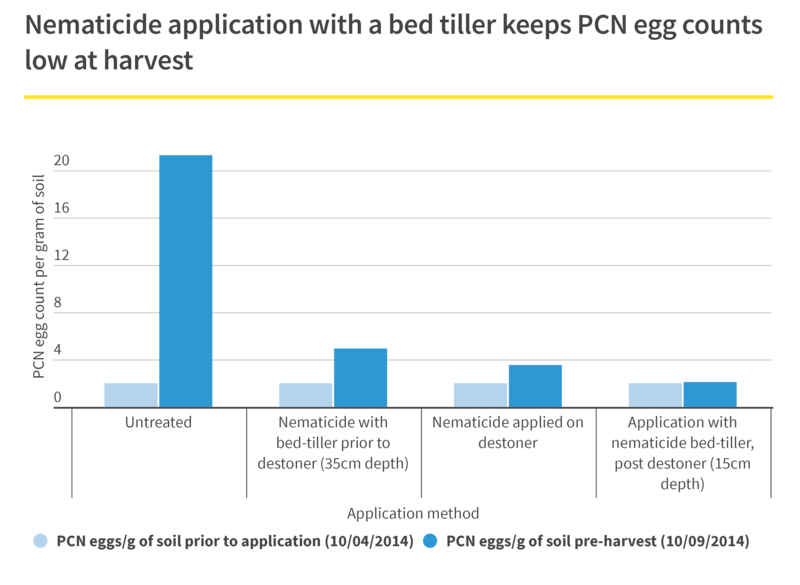 With PCN populations now reducing – most of his recent samples show just 0.5-1 egg/gram of soil – the name of the game is preventing population explosions, which are more severe when the pest is at low levels. As part of his integrated approach, Mr Webster is using granular nematicide Nemathorin (fosthiazate) to stop multiplication and in the past his application hasn’t always been as accurate as it could be. “We were putting it on with our Pearson Megastar stone separator, as it fitted into our system at the time, but it didn’t always mix the product through the soil properly. “It can also allow soil to ride over the stars without breaking up in certain conditions, so if you aren’t careful the product can be chucked out the side by the cross conveyor,” says Mr Webster. So, when the farm was asked to host the North West Potato Day in 2014, Mr Webster chose nematicide application as one of the discussion topics and trials were conducted using various incorporation methods alongside his own to uncover any differences. The farm’s standard application method using the destoner wasn’t the worst method of applying the nematicide in the trial (see graph), but was significantly less effective at preventing multiplication than incorporating nematicide with a bed tiller after the destoner and pre-planting to a depth of 15cm. Mr Webster says the results “kicked him up the backside” and made him realise he had to improve his method of applciation. “We are spending a lot of money on chemicals, so we need to make sure we’re getting the best out of them by following label and stewardship guidelines,” he adds. If nematicides such as Nemathorin are applied too shallow, the root zone isn’t protected from nematode attack and, conversely, if too deep the excess soil dilutes the product and reduces its efficacy. The Nemathorin product label recommends a broadcast overall application incorporated to 10-15cm for the best results, so Mr Webster went about finding a way of using the bed tiller method and achieving the 15cm depth as consistently and accurately as possible. 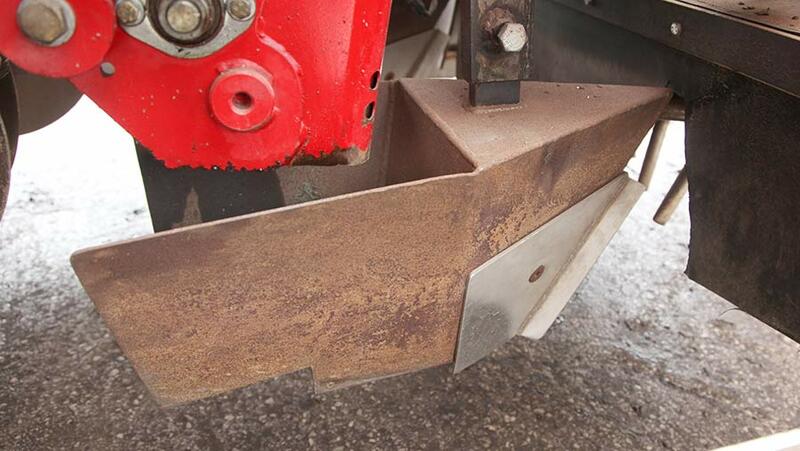 He soon uncovered that no manufacturer offered an auto-depth control system on bed tillers, with most using a depth wheel that runs in the wheeling. However, wheelings can vary significantly in depth after a pass with the destoner, depending on the amount of stone and clod in the soil, and would result in uneven application of the nematicide. After some head scratching, Mr Webster found inspiration for automatic depth control on his self-propelled Agrifac beet harvester, which uses a potentiometer linked to the lifting shares to automatically keep the front at the desired depth. He approached Massey Ferguson to see if a potentiometer could be positioned on a bed tiller and operated by the Trailed Implement Control (TIC) system on the Massey Ferguson 6616 Dyna-6 tractor used on his potato planter. 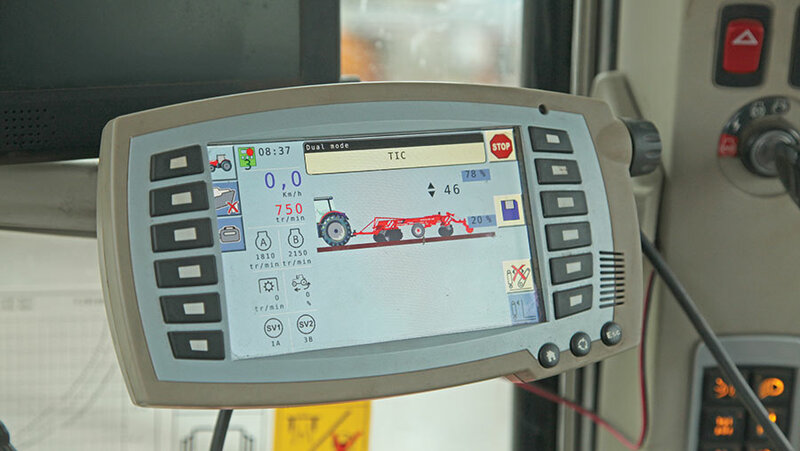 The TIC system essentially works like the draft control on a three-point linkage to keep trailed cultivation implements at a set depth via the tractor’s remote hydraulics. Although the company had no experience in doing so, its engineers thought it was possible and it provided him with the cabling and control box to give it a go. 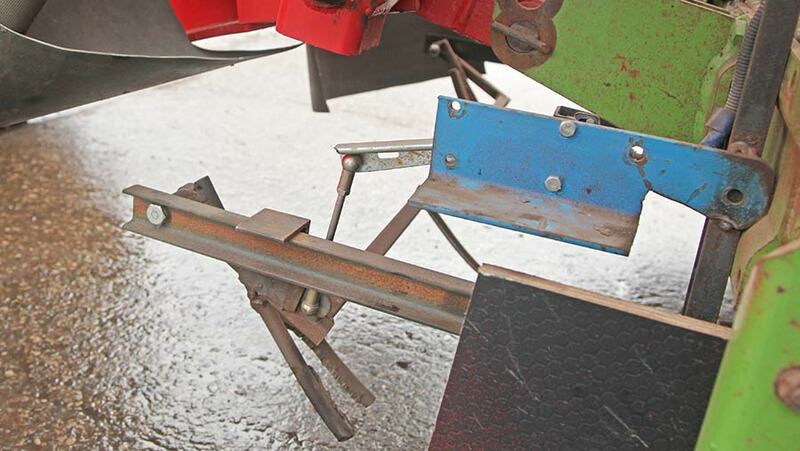 Using his existing Grimme bed tiller on the link arms, he placed a potentiometer on the veg hood, which follows the contours of the bed, and piggybacked his trailed Grimme GL 32T planter behind. In theory, the TIC should have controlled the depth of the bed tiller using the hydraulic ram and wheel assembly on the veg hood. However, Mr Webster says once the TIC was engaged it locked the link arms off, so while the rear of the tiller was adjusting itself to the desired depth, it couldn’t keep itself parallel to the ground and manual adjustment of the link arms was required to keep everything in sync. “The concept was there, we just needed to work out how we were going to get it to work automatically and the answer was to go fully trailed,” he adds. 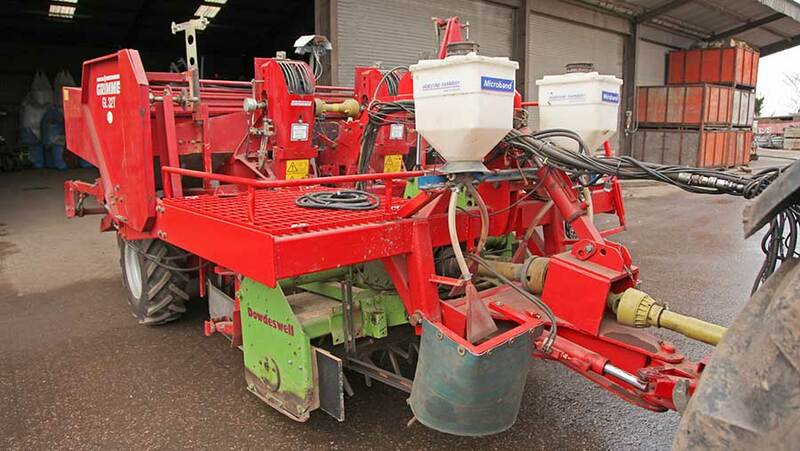 To do so, Mr Webster asked if Grimme could build a bed tiller into his trailed planter, but was quoted nearly £11,000 – more than value of the bed tiller and planter combined. 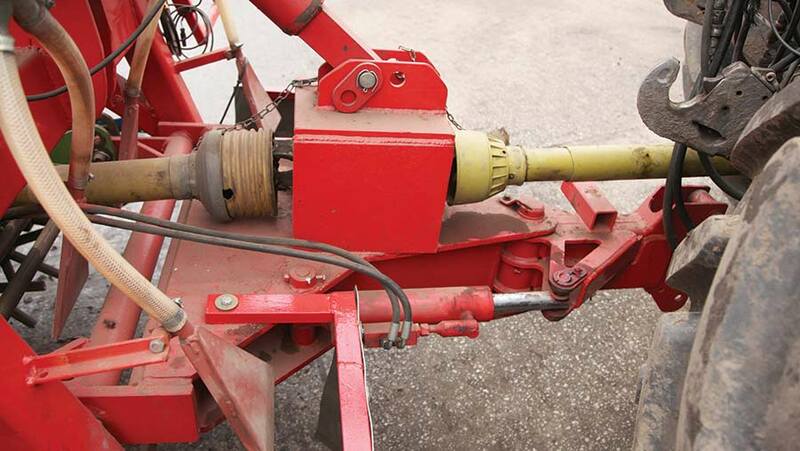 Instead, he acquired a Dowdeswell Rotorspike 130 from Shropshire and essentially cut the drawbar off the planter, sat the bed tiller in its desired position up front and built a carrying frame around it. The drawbar – complete with its original hydraulic steering mechanism – was connected to the bed tiller via a parallel linkage and a depth control potentiometer sits at the back of it. This was then connected to a skid that rides on the top of the destoned bed and is wired into the TIC system. In turn, this adjusts the depth of the bed tiller via a spool valve connected to a vertical lift ram on top of the machine. Nematicides are under threat of further regulation or withdrawal due to their inherent toxicity, so demonstrating they can be used responsibly and safely is essential to protect the environment, operator and consumer and ensure their approval is maintained. 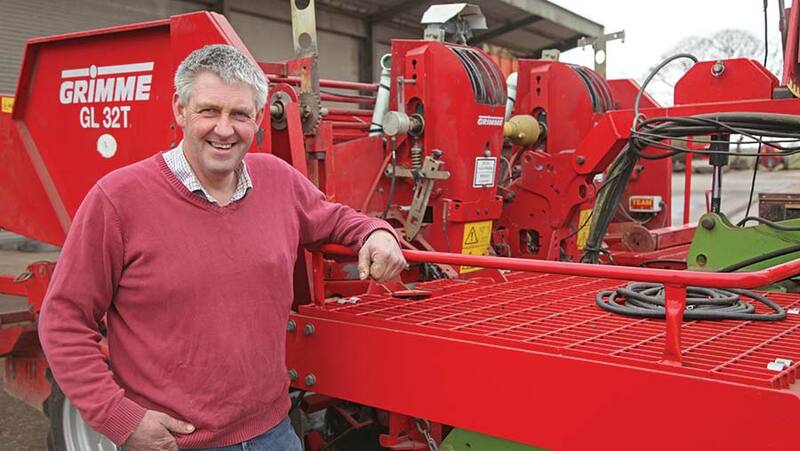 These messages are being communicated to growers via the Nematicide Stewardship Programme and Mr Webster believes his planter modification ticks many of the NSP boxes. It not only uses technology to ensure his nematicide is applied accurately, but guards around the two Horstine nematicide applicators’ outside fish-tail outlets prevent wind blowing the product off target.Also, a platform built above the bed tiller – made from steel mesh flooring and reached via a ladder – allows the operator easy, knee-level access to the hoppers mounted on the carrying frame, cutting the need for lifting product containers at height. “It’s essential we use these products wisely, as we can’t afford to lose them,” adds Mr Webster.